Click video above for a quick overview of the Woflman Enduro Tank Bag, Peak Tail Bag, and Enduro Carry-All Number plate bag as installed on our Yamaha WR250R Project bike. The photos above show a Wolfman Peak Tail Bag mounted to a Pro Moto Billet WR250R Cargo Rack. This bag/rack combination works great for hauling things around on the back of your WR250R Dual Sport or Yamaha WR250X Supermoto. The tail bag fits the Pro Moto Billet rack perfectly and is secured by wrapping its four mounting straps around the outer edges of the cargo rack. For its size, this tail bag holds a lot of stuff! The bags contents can be accessed very easily... you just un-zip the heavy duty zipper that runs around the top of the bag, then flip the top open (see photo above bottom/left). Internally, two straps keep its contents stable, and the top bungee-web is a great place to keep gloves and other things handy when off the bike. An expandable 4" gusset makes room for even more cargo when fully unzipped. The bag is stiff-sided to retain its shape and looks, whether empty or full. An optional waterproof cover is available as well. I've got my WR250R in sort of a Supermoto Adventure Touring mode right now. I'm hoping to do a Blue Ridge Parkway ride this summer, which will be practically all paved roads, so I'm thinking a luggage setup similar to what's shown above will work. Yesterday I installed a Pro Moto Billet "Rack It" Cargo Rack. Each of these PMB racks are CNC machined from a 1/2 inch thick plate of 6061 billet aluminum. The rack is then “hard black” anodized for durability, ease of maintenance, and protection from the elements. The rack will fit all 2008+ Yamaha WR250R's and WR250X's. Installation was pretty simple. All stainless steel mounting hardware is included, as are instructions. The rack mounts the same way as the Flatland Racing cargo rack. You first remove the seat and rear fender to access the rear subframe. On the bottom of the fender, Yamaha has marked 4 locations to drill holes that will line up with the 4 mounting holes in the rear subframe that hold the tail light/turn signal assembly to the bike. You drill 4 holes (5/8") in the fender at those locations, then put the fender back on the bike. Next you put the 4 aluminum spacers through the holes, place the rack on top, and insert the screws through the rack, spacers, and tail light/turn signal assembly, using locking nuts on the bottom. And just an FYI, I drilled slightly smaller 1/2" holes and then filed them out slightly so that the spacers fit in pretty tightly. If you drill the holes too big, the spacers could be loose and the rack might move around. The Pro Moto Billet rack sits about a 1/2" above the fender on top of 4 aluminum spacers that go through the rear fender and attach to the rear subframe. The rack is a bit larger than the Flatland Racing rack and covers more of the rear fender. These racks are specifically made for the WR250R/WR250X and are pretty much the same shape as the rear fender, just slightly larger in size. 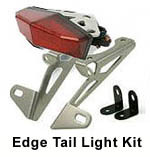 It gives you several ways to securely attach a tailbag or toolbag. Overall I really like the rack and will probably leave this one on the bike now that I took the Flatland Racing rack off. Both racks work great, but I like the slightly larger size of the PMB rack. Yesterday I installed a Flatland Racing Cargo Rack. One thing I like about this rack is how small and lightweight it is. The rack is constructed of durable aluminum and looks great on the rear of the bike. 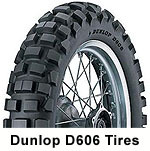 It will fit all 2008+ Yamaha WR250R's and WR250X's. Installation was pretty simple. All mounting hardware is included, as are thorough instructions. First you remove the seat and rear fender. On the bottom of the fender, Yamaha has marked 4 locations to drill holes that will line up with the 4 mounting holes in the rear subframe that hold the tail light/turn signal assembly to the bike. You drill 4 holes in the fender at those locations, then put the fender back on the bike. Next you put the 4 aluminum spacers through the fender holes, place the rack on top, and insert the screws through the rack, spacers, and tail light/turn signal assembly, using locking nuts on the bottom to secure everything. The rack itself sits about a 1/2" above the fender on top of 4 spacers that go through the rear fender and attach to the bike's rear subframe. Since the rack is attached to the subframe, it is very sturdy. There are 6 large holes in the rack and one slotted hole at the very rear. This gives you several ways to securely attach a tailbag or toolbag. Overall I really like the rack for it's inexpensive and simple design. 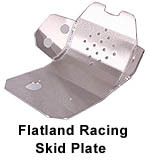 If you aren't ready to spend $140 on the Pro Moto Billet Rack, this one from Flatland Racing is a great alternative!